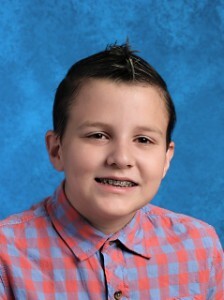 Geoffrey Norton, III is Student of the Month for February! Home/News/Geoffrey Norton, III is Student of the Month for February! Congratulations for being chosen as February’s Student of the Month, Geoffrey! Geoffrey is a JA-8 student whose favorite classes are English and math. His favorite teacher is Miss Poppleton and one of his favorite acheivements is becoming president of Builder’s Club. Along with his interest in participating in Builder’s Club, Geoffrey is interested in Tesla. Ms. Nash: In addition to being an exemplary student, Geoffrey volunteers regularly for Builder’s Club and organizing the Junior Academy library. He goes above and beyond in both his academics and community service. Geoffrey just spent two long days volunteering at the Balloon Fest alongside Key Club. He worked hard with one other club member to give away toys donated by Kiwanis. He also recently volunteered at the hospital putting together Stop the Bleed kits for all of Havasu’s schools. There are few that can match this young man’s character. Miss Poppleton: Geoffrey has been working extremely hard in math this year, taking detailed notes, asking questions, as well as helping others. He is constantly asking if there’s anything he can do to help me, both before and after school. Geoffrey comes to class with a positive attitude and strives to do well. I am so proud of how much he has grown in the last year!